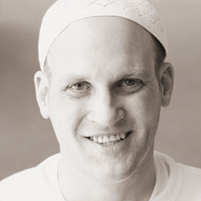 Andy Rasmussen is a KRI certified Teacher of Kundalini Yoga & Meditation. He came to the yogic path through a search for more effective and efficient meditative techniques for use against the common stresses of modern life. Andy has practiced or taught several “alternative” or energetic modalities, but found a home in the Kundalini technology. This is a powerful practice for “householders” who live normal, busy lives in the world. Kundalini Yoga as taught by Yogi Bhajan® is known as the “Yoga of Awareness”, and is considered the most comprehensive of yoga traditions; combining meditation, mantra, physical exercises and breathing techniques; it is a Raj (Royal) Yoga, encompassing the eight limbs of yoga into a singular scientific practice for the mind and body, and to elevate the spirit. Its practice rebuilds and strengthens the nervous system, which has been weakened by stress and abuse. Kundalini meditations are tools to encourage better concentration and relieve chronic stress and nervous tension. For Andy and his students the daily meditation practice brings about a positive self-image, a feeling of wellness and enhances peace of mind and a greater awareness or consciousness. The discipline allows you to deal with obstacles in life that seem insurmountable; the yoga & meditation working together to provide you with the psychological advantage necessary to remain calm and non-reactive under the most challenging situations. Andy is a former radio host and current podcasts and public speaker. He has two regular podcast series: one on American History and another that explores the intersection between yoga & meditation and traditional LDS theology. Finally, as with many Utah natives, he has long sought contemplative release in nature and currently works with Trout Unlimited to conserve and protect cold, clear, clean watersheds throughout Utah and the West. He also co-owns Roundrocks Flyfishing in Logan, runs a real estate business, and most of all, loves spending time with his lovely wife and four(!) boys.